Welcome to the latest edition of 'The Bridges', The Chamber Quarterly newsletter. Click Here to learn more about current Chamber events and activities that can benefit your organization. The Chamber of Southern Saratoga County has become recognized statewide in recent years for its prowess in supporting the interests of agriculture throughout our region. In the latest issue of The Bridges, learn about how farms and agriculture are big business in Saratoga County. 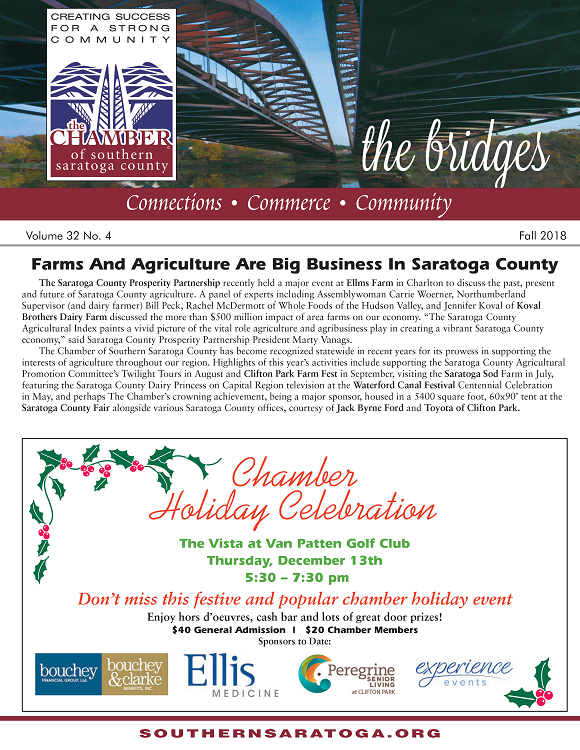 In this issue of The Bridges, learn about how your Chamber is always here for you! As summer winds down and the busy fall business season approaches, take a minute to review the to do list included to be sure you are taking full advantage of your many Chamber membership benefits. In this issue of The Bridges, read about the Waterford Canal Festival Centennial Celebration, Saturday, May 19 | 10am – 6pm. Don't forget to Mark yourself “out of the office” on July 16 and enjoy a mid-summer’s day on beautiful Van Patten Golf Course! 2018 offers members new opportunities to engage throughout the community. Learn more about the Waterford Canal Festival Centennial Celebration this May 19 from 10am – 6pm. The Chamber extends a sincere thank you to all of our almost 1100 valued members as we celebrate 50 years of serving Southerns Saratoga County. Our Executive ACCESS Program kicks off on 09.08.17. Register today for the Chamber of Southern Saratoga County Golf Tournament benefiting the Chamber Angels on 09.25.17. Our Executive ACCESS Program begins in September. Participate in the Chamber of Southern Saratoga County Golf Tournament benefiting the Chamber Angels. Don’t miss the opportunity to celebrate this milestone chamber event with fellow members and friends and be part of the Chamber’s largest networking and social event of the year! This special event marks the kick-off of a year long celebration in 2017 to Commemorate the Chamber's 50th Anniversary . The Fireballers are Coming to Southern Saratoga. Come out and be part of this great show which has helped find dozens of missing children and return them to their homes. Save the Date: The Chamber of Southern Saratoga County Golf Tournament benefitting the Chamber Angels, Monday, June 13th The Edison Club, Rexford. Join us for the 2016 Chamber of the Year Awards Dinner. This dinner affair celebrates the many accomplishments of 2015 and sets the standard for a successful 2016! Join the Chamber Board of Directors along with fellow members for a special holiday networking event. Sponsorships are still available for the Holiday Celebration. Contact Nigar Hale at nigar@southernsaratoga.org and secure your sponsorship today! Inside this issue are all the Chamber news and updates including Women in Business Fall Luncheon, Member Website Lunch Labs, Chamber Staff Announcements, Upcoming Mixers, Backpacks of Hope Assembly, Schmooz-A-Palooza, Chamber Angels and More! Virtually every business can benefit on Google from the authority of the Chamber website! Trackable Advertising Opportunities and SEO helps you with Google searches. Learn how to get the most value from your Chamber Membership. Join us for the 2015 Chamber of the Year Awards Dinner. This dinner affair celebrates the many accomplishments of 2014 and sets the standard for a successful 2015! Learn about valuable business experience training seminars deisgned to grow your business. Below you are invited to browse the Chamber Bottom Line Newsletter Archive containing 3 years of back issues of Chamber history courtesy of the Bottom Line Newsletter, a well-received publication which has informed Chamber members for many years.